A night or two before we left town that fall (in 1884), we were all together with the girls, drinking and having a good time, and I got dressed up. Cowboy Annie put her gold chain around my neck, and wound her scarf around the crown of my Stetson, and this dressing up in a woman’s clothes started us talking about the stunt that Jake Des Roses pulled at Ogallala the year before. There was a dance going on and not enough women to go around, which was the usual way of it in that country, and a couple of fellows got left without a partner. So one of them said: “I’ll fix that.” And he went in a back room —this was in a honky-tonk, of course—and he came out with a pair of women’s white ruffled drawers pulled on over his pants. He and the other fellows danced around, and it brought the house down. We told her the story. It went all over the range, and it even got into books. So we were talking about it and Cowboy Annie turned to me. “Would you do that?” she says. 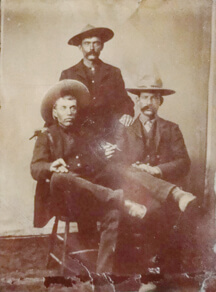 Teddy Blue Abbott, John Burgess, John Bowen, Miles City, Mont., 1884. I said yes, naturally. So she pulled them off, and I put them on over my pants. And we all paraded down the street, me with my gold necklace and the trimming on my hat and Cowboy Annie’s drawers on. The whole town turned out to see us. It turned the place upside down. Well, that was the kind of wild, crazy stunts that gave me my reputation. They tell about a thing like that clear down to Texas, especially anything that came up that was funny. The reps would ride around to the roundups and carry it along, and in the wintertime the grub line riders would carry it. We had to talk about something. It was all the fun we had. Next day, or the day after that, we all left for the mouth of the Musselshell. In the morning when we was ready Burgess wasn’t there. Somebody had seen his horse, with the reins dropped, standing in front of the parlor house, and I went up there to get him. He was in cowboy Annie’s room. He had been to the bank and got money and gone back there to pay her, for the week. And when I came in—because I was a friend of them both—she flipped back the pillow cover and showed me the yellow pile nestled there— seventy dollars in gold. Cowboy Annie was her name, and the N Bar outfit was her game. … And when the beef is four years old, we’ll fill her pillow slips with gold. I still had Cowboy Annie’s ruffled drawers that she gave me that night, and I put them on a forked stick and carried them that way to the mouth of the Musselshell, like a flag. And before we left, my girl took one of her stockings off and tied it around my arm, you know, like the knights of old, and I wore that to the mouth of the Musselshell. After we got up there, I had the flag hanging on the wall of the cabin, until Harry Rutter got sore one day and tore it down and throwed it in the stove. He said it wasn’t decent. And no more it was. We spent that whole winter at the mouth of the Musselshell, which comes in where the Missouri River makes its big bend, 135 miles east of Great Falls. As I believe I said before, this was the third N Bar outfit. The 4,000 head of cattle that they trailed up here from Texas was all steers, and they was going to run it as a steer outfit, no cows or calves, just bringing in more steers from time to time and double-wintering them and shipping the beef. That was the plan, but it never worked out. There was an old trading fort at the mouth of the Musselshell that was just standing there deserted, and we took it over that winter and lived in it. There were several large buildings and a stockade and corrals, and a two-room house that was quite a good size as log houses go, but there is nothing left of any of it any more. It all went into the river years ago. The house was built for a storeroom and store at the old trading post, and it had a counter and a puncheon floor. This was the old store that was used by Billy Downs and the gang of horse thieves, and that he was living in when Granville Stewart and his raiders came and got him and hanged him in the summer of ‘84, a few months before we got up there. They hanged or shot 14 of them at different places along the Missouri River, including this Billy Downs, who was more or less the bookkeeper and storekeeper for the bunch. Before he met his end, in the early part of July, the vigilantes come for him another time. They say it was to warn him, but I don’t know. Anyway they didn’t get him the first time, because he knew they were coming. And he dug a hole under the heavy timbers of that puncheon floor, just big enough for himself and a jug of water and some food, and he hid under there until they went away. I know that is true, because when we took down the counter to make room for our bunks, we found some loose timbers underneath. And we lifted them up, and there was his hole that he hid in. It looked like a little grave. That flat at the mouth of the Musselshell has seen a awful lot of Montana history, and bloody history at that, but soon it will all be under the water of Fort Peck dam. There had been two forts on the site before we got up there fifty-four years ago, and the one we took over was the second. You see that location always appealed to people in the early days as a good place to start a town. The bluffs widen out there, leaving this big flat where the Musselshell river winds along into the Missouri, and a couple of creeks come into the Musselshell, and there is lots of room for houses. The first fort was built in 1868 by some Helena businessmen, who were promoting a town at the mouth of the Musselshell to take the river trade away from Fort Benton. The idea looked good, but there was a couple of things the matter with it, and the worst one was Indians. The place was always a bone of contention with the Indians, especially the Sioux. They didn’t seem to want anybody to settle there, I don’t know why, unless it was because they always use that place for crossing back-and-forth over the river with their hunting parties. Old-timers had told me that when there wasn’t any trouble anywhere else in Montana there would still be raiding at Fort Musselshell. Henry McDonald said that at the mouth of the Musselshell in the country right around it there was more than thirty different massacres of white people by Indians. I got a lot of this early history from MacDonald, who was a trapper at the fort when they had all the trouble. He was a little chap, not over 5 feet, 5 inches tall, and he was a Pony Express rider and a great hunter and Indian fighter. What I didn’t get from him I got from Pike Landusky and two or three other fellows who was there at the time. They told me that during the spring of ‘69 there was always somebody waiting in the hills to snipe them, and they was afraid to go out from the post only in bunches. That was the spring Jenny Smith got scalped, that woman I told you about who was living in Forsyth in ‘83. Some men were getting out timber up the Musselshell, and Jenny and another of them women, a squaw, I think, was taking their dinner out to them, when a bunch of Indians jumped them. The second woman was killed, and Jenny was wounded and scalped alive. She played dead while they were taking her scalp, and that was the only thing that saved there. I don’t know how she did it, but she did. A few weeks after that was when they had the big fight at the mouth of the Musselshell and killed thirteen Indians, and that put an end to the raiding for a little while. They had been sniping at the settlement all the time, like I told you, but they played the coward and would run off if anybody opposed him. Pretty soon it got so all the white men got brave enough to run out and chase them when they came around. One day a little bunch of Indians had come in and started some trouble, and the whites was chasing them up the flat as usual, when a shot from one side killed the front man. They found out they was just about to run into an ambush. It turned out there was sixty or seventy Indians down in a cul-de-sac, I suppose you call it, a sort of pocket that water had washed out along the Musselshell, or it might have been one of those old cutbanks where the river had changed its course. Henry MacDonald and a couple of other men swum the river and got around behind them in those thick willows on the riverside, and they opened up on them from there. Meanwhile the rest of the people had come out from the settlement and had got out in front of them, on the bank. And it started to rain, and that wet the Indians’ powder and put their old-fashioned guns out of commission. Mac said it was an awful site to see their terror when they found out they were trapped. There are eyes was just popping, and they ran every which way, like rats. He said you could hear them panting in that quiet, and some of them ran straight into the guns. Thirteen were killed in the cul-de-sac, and thirty more of them died on the way to camp. Jenny was watching the fight from a bastion of the fort, and they say that when the boys came in with thirteen fresh scalps she felt consoled for having to wear a wig. Little Mac, as they called him, was wearing a whole buckskin suit when he swum the river, and the trousers lengthened so much when they got wet that they tripped him up. So he took them off and went through the fight naked from below the waist. After it was over he was on his way back to the settlement to get some clothes, when he ran onto a couple of Crow Indian squaws that were living at the post with the white men. He said their attentions was quite embarrassing to him. It was after that fight that Liver-eating Johnson held up a piece of an Indian’s liver, that he had cut out, and said: “We’ll have liver for breakfast.” I’ve been told by fellows who was there that he never did eat that liver, but he always went by the name after that. Those Indians had been picking on the settlement for a long time and there wasn’t any mercy shown. Old Cap’ Andrews, the trader at the fort, cut off ten of the Indians’ heads and boiled them and scraped the flesh off, and put them up on steaks on the stockade. They say the site was quite a shock to the lady passengers on the first steamboat of the season, when they got up there on the spring rise a couple of days later. After the Indian troubles that spring, the company that operated the main post give up and went out of business and most of the settlement went with it. The first fort and the houses was all in the river by the time we got there, except that you could still see the trench where they sank the logs for the stockade. But there was another trader at the mouth of the Musselshell, Colonel George Clendennin, and after the first company quit, he rebuilt and refortified his own post, and stuck it out four more years. He moved up the river to Caroll in ‘74 and his old fort was the one we lived in. From the time he left until we came in there ten years later, there was nobody much at the mouth of the Musselshell, except a few woodhawks (sellers of cord wood to steamboats) and those outlaws. Since that time I have read quite a few historical writings about the mouth of the Musselshell, and I noticed that the writers, knowing all about how many people was murdered and scalped and hanged there in the early days, always talked about what a gloomy-looking place it was. But we were new-come there, we hadn’t heard those stories, and it looked all right to us. As far as scenery goes, I don’t see anything wrong with it today, only it is lonely and desolate. You can go there and back from Lewistown in a day by car, in good weather, but it is way the hell and gone over steep hills and a narrow Gumbo Road. If it rained, you’d be stuck there for a week. There is nothing in there at all except a few ranches, and most of them are deserted on account of the dam coming. Up to a few years ago they used to run one of them old cable ferries across the river, but it is stove up now and pulled out on the bank. Everything is changed from the way it used to be, only the old Big Muddy rolls along, chewing at her banks like she always has. And even that is going to be changed, because all that part of the river will be flooded by the dam. It is very rough country in there. Granville Stuart used to say it was so rough that the magpies wings got broke flying over it. Going back from the river there are great big timbered breaks that look like the foothills of a range of mountains; and back of that, all those coulees head out on a big level divide, covered with grass and scattered bull pines. You can drive for miles along the top of the blind without seeing a fence, and the country looks just the way it did 1,000 years ago. After we got up to the mouth of the Musselshell with that herd, we turned the drags loose first, at a little creek that didn’t have any name. So we called it Drag Creek. And Drag Creek it is today as you can see by the sign on the bridge where the road crosses it. We turned the string Lewis when we got down on the flat, and the leads we started up Crooked Creek, which is the last stream that comes into the Musselshell before you get to the mouth. The cattle was supposed to graze away from the river, up on the divide, but we couldn’t keep them there because those timbered breaks was full of bear. It may be that the old bad luck that lived at the mouth of the Musselshell still held against us, or rather against that N Bar outfit. Because the next year they give it up, and quit that place, and moved all their cattle down onto the Big Dry. After we got back to the mouth of the Musselshell from Miles city, we all settled down for the winter. There was nothing else to do. Our outfit was the only one in that country, we had no neighbors of any kind, and the nearest town, if you could call it a town, was Rocky Point, forty-five miles up the river by horseback. There was a few stores at Rocky point, and a saloon run by a man named Marsh, and three white women. One was Mrs. Marsh, a very nice lady who kept the eating house. She had a daughter. And there was also a woman they called Big Ox, who was one of those hay bags that used to follow the buffalo camps. They had the damnedest names, those big old fat buffalo women. Most of them can’t even be told. Our girls, that followed us up from the south, never had names like that. They were called Cowboy Annie and Gentle Annie and the Texas steer and such—the worst name I ever heard among them was Tough Lil. But they was a different kind of people. There was nothing like that up here. We was in a wilderness and we had to make the best of it. As for Big Ox, I have heard men say that when a man was starving he would eat crumbs and worse than crumbs. There was a few other towns along the Missouri River, but they was further away from us than Rocky Point and no different when you got there. Claggett and Caroll were between Rocky Point and Fort Benton. There was ferries at both of them, and after the Great Northern was built, the freight teams would cross over there, taking supplies to Fort Maginnis. But all those river towns except Fort Benton have practically disappeared today. There isn’t any reason for them any more, now that the steamboats, and the buffalo, and the bull teams, and the Army Post, and the Indians, too, are all a thing of the past. About eighteen years ago there was another spell of activity along the river, but it was a different kind. In 1919 and 1920 every foot of that country back from the Missouri on the south side was taken up for dry farms, which was a crime, because that is grazing country, not farming country, and all those bohunk farmers did was to carve up good range for nothing but starvation in the end. There is not a sign of them today. They’ve all gone; even the empty houses have gone; you can drive along there for miles and not see a thing except once in a long way and old claim shack, that hasn’t been tore down yet for the lumber in it, and a few fence posts with the wires stripped off them. But the hills are still there. And this summer, 1938, the grass came back the way it used to be and waved in the wind. And oh, boy, but it was a beautiful sight. The winter of ‘84-’85 John Baldwin stayed at Rocky Point, to ride that end of the range and watch for rustlers. He took his own bed and slept in Richie and Collins’ warehouse, and the outfit paid his board with Mrs. marsh. In the warehouse Richie and Collins had a barrel of Indian whisky setting on an old block and a tin cup on top of it, and you could go in there and help yourself. That was how cheap it was. Now I’ll give you the recipe for Indian whisky, that was invented by the Missouri River traders in the early days. You take one barrel of Missouri River water and two gallons of alcohol. Then you add two ounces of strychnine to make them crazy—because strychnine is the greatest stimulant in the world— and three plugs of tobacco to make them sick, because an Indian wouldn’t figure it was whisky unless it made him sick, and five bars of soap to give it a bead, and a half pound of red pepper, and then you put in some sagebrush and boil it until it’s brown. Strain this into a barrel and you got your Indian whiskey, that one bottle calls for one buffalo robe, and when the Indian got drunk it was two robes. And that’s how some of the traders made their fortune. I never heard of it being sold anywhere except in those posts along the Missouri. White men didn’t drink much of it because it wasn’t fit stuff for a white man. Only they did drink it sometimes. To show you what Indian whisky was, I can tell you a story about the time Harry Rutter came down to Rocky Point that winner on a visit. We left him out at the mouth of the Musselshell in charge of the outfit the time we all went to Miles City, and this was the first he’d been in a town since the day we was camped on Sunday Creek and him and me went into Miles City on a sneak. He was celebrating around for a while, and he got pretty full in the saloon. When it got late, he came back with John Bowen to the warehouse and put his bed down, and the two of them laid there and talked. And as they talked, Harry kept helping himself out of this barrel of Indian whisky. Finally he stretched out and got ready to go to sleep, and then he said to John, very solemn and careful: “John, will you do me a favor? Will you close my eyes for me?” He was so drunk he couldn’t close his eyes. The outfit was keeping us for the winter, as the custom was in those days, because good hands were scarce and it paid the owners to keep the men who knew their range and brands, so they would have a crew together when spring came. But we were laid off for two or three months without pay, there being no work of any kind. They didn’t feed hay to the cattle in the early days of the open range; and in fact you couldn’t have fed them even if you’d had the hay, because they scattered out so. We weren’t as bad off as that at the mouth of the Musselshell, because we had good company. But there wasn’t anything to do except talk, and talk soon ran out. We told each other everything we knew in a week. I knew about ten songs, and I sung them until everybody was sick of them. After that nobody had much to say. It’s not that men get to fighting when they are holed up together, unless there is some reason for it, but they get kind of surly and quit talking. For a while we go out and kill deer for meat, and that was something to pass the time. Over in those hills there was so many tracks, you’d think it was sheep. It was deer, hundreds of them. We ate them until we couldn’t look at a piece of deer meat any more, and our beef was so tough, having walked all the way from South Texas, that you couldn’t eat it either. So after that it was nothing but sowbelly and beans, three times a day. We did have a couple of visitors. The summer before we came to the country, as I told you, the cowmen along the Musselshell had got together a party at vigilantes and hanged a lot of horse thieves. A few of the thieves got away across the Missouri, and one of the ones that escaped come back and stayed with us a week that winter. We didn’t know his name. He just said he was out of grub. But another fellow that was staying with us told us afterwards who he was. This other fellow, whose name was Frank Hansen, was camped with the horse thieves down on the river when Granville Stuart killed a lot of them, and he came mighty near being hanged himself. We knew all about him, but we had to take him in just the same. The law of hospitality on the range was very strict. You had to feed and shelter your worst enemy if he came to your house in a storm, and if you refused him shelter, you had better leave that country. This Hansen didn’t get hanged because he didn’t run away when the vigilantes came after him, though he had a good horse and might have made it. And besides that, one of the vigilantes knew him and vouched for him, so they let him go. While he was with us, Hansen got to passing remarks about this fellow who had saved him, calling him a killer and cussing him out generally. It was true enough, I guess; the fellow had an ugly reputation, but as Harry Rutter said: “If a man save my life, I’d be more of a man than to cuss him.” We didn’t like Hansen after that, and there was some bickering, and we finally gave him some grub and turned him out of camp. Visiting from one outfit to another, or riding the grub line as it was called, was one way a man could live during the winter. Lots of cowboys that could have stayed at home and lived off their own outfits would go visiting just for the sake of variety, if they didn’t have a horse, the company would give them one, and they would bring it back in the spring. Grub line riders were welcome wherever they stopped, because people who had been shut up all winter we’re glad to see new faces. They brought the news of the range. It was a grub line rider who came down and told us about the pretty girls at the DHS. This was Granville Stuart’s outfit, and it was located a long way to the south of us, in the Musselshell country, east of the Judith Mountains. The fellow told us that Granville Stuart had two grown daughters living at the ranch with him, and an old partner of his named Reece Anderson had three more. This was the biggest kind of news to loan cowpunchers. Most of us hadn’t spoke to a nice girl in years. I know I hadn’t; only to a few married ladies. We talked them all over for days, and each of us picked out the one he was going to marry. It was something to talk about. And I remember I picked the younger one of Granville Stuart’s two daughters, and I can tell you the reason. The grub line rider told us that Granville Stuart said he would give five hundred head of cattle to whoever married the oldest girl, though he said the little one, only fifteen years old, was the best looking of the lot. And I remember the horse wrangler said: “I’m going to take the oldest one and get the cattle.” And I said: “I’ll take the pretty little one.” And we picked up our hats and went outside—said we were going right over to the DHS to get these girls, seventy- five miles away. We were joking, of course. We went about ten feet in the snow and come back—concluded we needed to wait until spring. But I did marry the little one, not quite five years later. And that was about all there was to that winter. Except that along towards spring Burgess decided to run a fence in the angle between the rivers and have a hay meadow there, so he put me to work digging post holes with a grub hoe. I wasn’t strong on digging, especially not with a hoe. The ground was hard anyway. So I just scratched them, and when Burgess came to put up the posts that spring, he couldn’t find the holes and he fired me. After that I went to work for the DHS.